As far as one bear family knew, they had nothing to be concerned about. In fact, they were probably under the impression that they hit the jackpot. After all, the Massachusetts neighborhood they lingered around was rife with bird feeders. It was an easy source of food after a long winter spent in hibernation. Residents of the neighborhood had seen the mother bear lurking around for weeks on end. But it was that very same convenience that ultimately led to tragedy. On Monday morning, the two bear cubs were found stranded in a tree. Their mother lay motionless on the ground. Unbeknownst to the young cubs, this would be the final time they saw her. Officials discovered that the mother bear had been electrocuted by a nearby high-voltage wire. 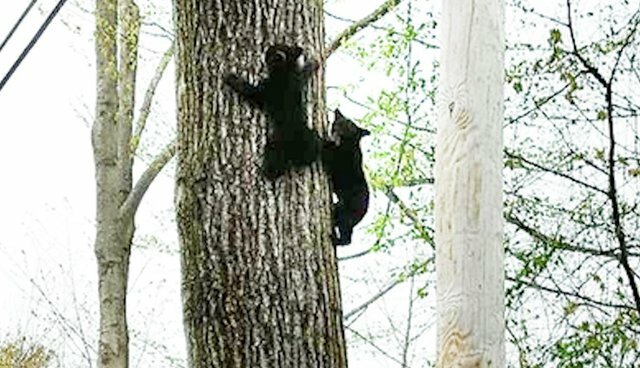 The powerlines in the area were secured and Massachusetts wildlife officers, in coordination with the Gardner Fire Department, rescued the two orphaned bear cubs, who were found to be in good health, according to a Facebook post by the Massachusetts Environmental Police. Still, the loss of their mother was something that could have been prevented. "The demise of these bears was being fed by people," Sergeant William Woytek of the Massachusetts Environmental Police told CBS Boston. Large amounts of both corn and sunflower seeds were found on the ground in the area the bears were in, according to officials. "Homeowners are cautioned that bears finding birdseed, corn or other bird food will often revisit that site, drawing bears closer to people, resulting in bears losing their fear of people, a process called habituation," Massachusetts Environmental Police explained on Facebook. Habituation can get bears into dangerous situations, such as the one that caused two bear cubs to lose their mom. "The cubs are not old enough to survive on their own yet, so they were taken to a rehabilitator who specializes in black bears," the Massachusetts Division of Fisheries & Wildlife wrote on Facebook. "They will will stay with the rehabilitator until they are able to survive on their own." Check out these tips on how to prevent wild bears from becoming dependent on food sources provided by humans.